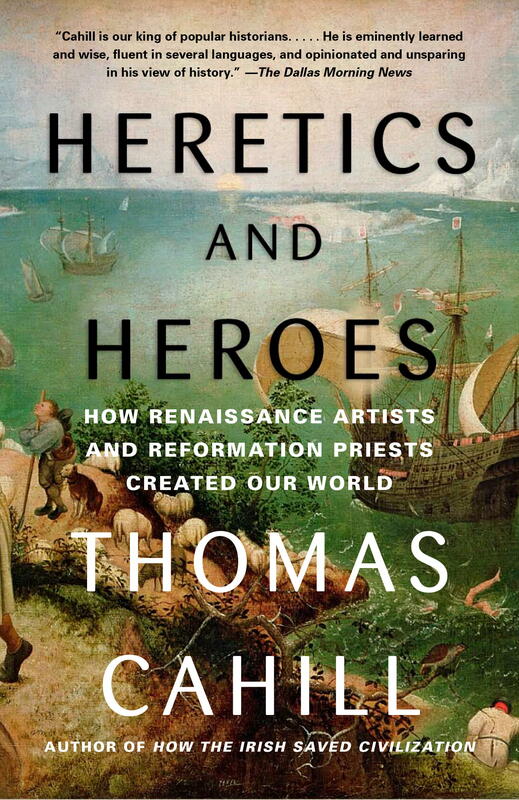 From the bestselling author of How the Irish Saved Civilization, a fascinating look at how medieval thinkers created the origins of modern intellectual movements. Click here to view a timeline from Mysteries of the Middle Ages. Listen to an audio excerpt from the book. "A prodigiously gifted populizar of Western philosophical and religious thought spotlights exemplary Christians in the High Middle Ages... Cahill serves as an irresistible guide: never dull, sometimes provocative, often luminous." "A fresh, provocative look at an epoch that's both strange and tantalizingly familiar." In the first decade of the twelfth century, a little girl from the Rhineland town of Bermersheim, near Mainz, was offered by her parents as a sacrifice to God. Her name was Hildegard; her parents were Hildebert and Mechthild, a pious knight and his pious, well-born wife. Hildegard was eight years old when she was left for life with an anchorite named Jutta von Sponheim, who lived alone in a cell attached to the abbey church of Saint Disibod. (Disibod was a whimsical Irish monk-bishop of the seventh century who, disappointed at the lack of response to his preaching by his own countrymen, traveled to the Rhineland, became a protégé of the English Saint Boniface, evangelist to the Germans, and founded Disibodenberg, where he seems to have been rather more successful than he’d been in his native land.) Not only does Hildegard’s story embody many of the cultural currents that reached their ebb in her time or soon after; this outwardly obedient daughter, her childhood cut so cruelly short, was destined to become one of the most important women of her age. Using a living child as a religious oblation was no Christian invention. Greeks and Romans had ancient traditions of chaste priestesses and Vestal Virgins; and in the oldest records of both pagans and Jews we find evidence of “set-asides,” human offerings devoted to a divinity. In the earliest archeological records, these offerings are literal human sacrifices, such as the bog burials of Scandinavia. Jewish tradition yields such offerings in surprising numbers, starting with Abraham’s willingness to sacrifice his only son and continuing through Joshua’s command to his troops to “devote” the people of Canaan to God under “the curse of destruction”—that is,to execute them. In later times, prisoners of war were no longer slain outright, but firstborn males still had to be “consecrated to the Lord” and then “redeemed” by an animal sacrifice that was substituted for them, as happens to the newborn Jesus in the second chapter of Luke’s Gospel. There is even a further echo of Jewish tradition in the offering of Hildebert and Mechthild, for Hildegard was their tenth child—and a tenth of one’s wealth, the tithe of the Hebrews, was consecrated to God. But none of these grand historical precedents would have impressed an eight-year-old, who must have spent many a lonely, creepy night tucked away in Jutta’s sparsely appointed little hut. Anchorites are no longer an everyday occurrence—I have met only one in my life, and she was nutty as a fruitcake—but in the twelfth century they could be encountered in the neighborhood of many a monastery and even within the close of an urban cathedral. The word anchorite derives from a Greek verb meaning “to withdraw”; and we may best think of them as hermits who lived not in obscure caves but in association with a religious community. Your typical anchorite, though not necessarily a formal member of such a community, was nonetheless part and parcel of its sacred landscape, so much so that she (or he) would normally reside in a small room built into the wall of an abbey church or cathedral, a room with a view, so to speak—a slit or screened window that allowed the anchorite to attend church services but not so large as to make her visible to the merely curious. The liturgy for the consecration of an anchorite was actually a funeral liturgy, for it was deemed that she was dying to the world and to herself. She was spoken of as already dead and with God in heaven. Her cell was called frankly her “burial chamber,” and, dressed in her shroud, she was directed to sing a verse from Psalm 132: “This is my resting place forever, here shall I dwell for I have chosen it.” The ceremony, attended gregariously by family, friends, and monastic benefactors, must strike us as a ghoulish sort of celebration, often ending with the ritual interment of the anchorite in her cell, from which it was expected that she would never again emerge. Brick was cemented on brick till the doorway to the cell was blocked and only the slit was left, enough for food and other necessities to be passed to her. If the ceremony did not conclude with an immuring, it concluded with a permanently locked door. But because this period is characterized by such variation in custom from one locality to another, we cannot be certain what was done in Hildegard’s case, nor whether the growing girl was permanently locked away in thecustomary single room. We do possess one odd detail that may bespeak a certain mitigation: at least one servant was locked in along with the anchorites. Jutta and Hildegard were, after all, noblewomen and so could not be expected to manage even their much-reduced needs by themselves. The idea was to serve God by permanent prayerful retreat from the world. However bizarre this may sound to modern ears, we probably all know a few people whose apartness (or even madness) might be better served if such a socially approved role were still available. Though often represented as a period of repression, heavy with superstition, the Middle Ages offered—at least in religious roles—more options than are now allowed. I doubt that a frail suppliant, plainly dressed and with a distracted air, approaching a bishop today to say that God had instructed her to build a cell into the wall of his cathedral and to carve in that wall a small window from which she could hear mass, as well as the canonical hours, would receive a warm response. But in the Middle Ages such social oddities were welcomed and assigned a place of honor. While the rest of us went about our worried lives, they prayed for us continually, speaking always to God on our behalf. The masters of the Middle Ages had, of course, another, less public motive for honoring anchorites. The batlike monks of the Prologue who terrorized the citizens of Alexandria might have been politically useful to the patriarch, but as time went on such mobs, vociferous, usually illiterate, became a religious plague. They could not be appeased by compromise; they were rabble-rousing extremists, unswervingly certain of their rectitude. Their implacable attitudes gave bishops, as well as other public men in charge of social order, terrible headaches. How were they to be quieted? By being brought under the bishop’s control, by being made subject to his rules and approval. Every monkish mob was incited by a leader, often a desert hermit cherished for his holy ability to live apart from society, eating locusts, whipping his body, gifted with extravagant visions. The word monk derives, in fact, from the Greek word monos, meaning “alone, lonely, solitary.” In the rudimentary beginnings of monastic life, all monks were hermits, and only gradually did they unite in loose association with one another. Bishops began to invite the most influential solitaries to take up more conventional habitats, closer to human society and more readily subject to episcopal pressure. Monks and nuns, monachi and monachae, were made to write constitutions by which their communities were to be governed. In time, such constitutions came to be submitted to a bishop for his approval. In the West, Saint Benedict, Italian founder of the Benedictines, became in the early sixth century the great constitutionalist, his Rule the standard by which all subsequent monasticism was judged. The monk’s life was utterly subject to his dictum Ora et labora (Pray and work). No rabble-rousing, please. Let anarchy be not so much as mentioned among us. In time, obedience, tranquility, and constructive employment—building, farming, herbal medicine, relief for the poor, succor for the sick, hospitality to wayfarers, manuscript copying, and (in the case of a gifted few) original writing—not vision, came to rule the Christian West. The Benedictines, in addition to vows of obedience, chastity, and community of goods, took a vow of stability, which meant they could not leave the monastery grounds without their abbot’s permission. Even prayer was measured out at appointed hours. No moment of the monk’s day or night belonged exclusively to him. The bishops, who—thanks to the barbarians—had quite enough on their plates, required such a church, where everyone, even a visionary hermit, could be counted on to play an assigned role and to stay within prescribed limits. No one had done so much to spread the fame of Saint Benedict as Gregory the Great, who was himself a Benedictine monk and had written Benedict’s Life. By Hildegard’s day, even an abbey like Disibodenberg, originally a foundation of Celtic spontaneity, had submitted to the Rule of Saint Benedict. In the abbey church, the monks sang the canonical hoursa—as did all Benedictines from Britain to Bohemia—and from a lancet opening in the choir wall a single female voice united with theirs in chant. One day, a pure child’s voice joined in, inflecting the Latin words precisely, ascending gloriously and certainly to the subtle rhythm of the music. In their choir stalls the monks shivered with emotion: it was the voice of the child anchorite, the noble Hildegard. We know little of what went on in Jutta’s cell, but we know the results. Under the older woman’s tutelage, the child learned to read the Book of Psalms in Latin and to sing the psalms of the monastic hours, the church’s Divine Office, while accompanying herself on the expressive ten-string psaltery, a sort of dulcimer plucked by hand.Throughout her life Hildegard’s Latin remained odd, at moments an almost private language. But her grasp of the principles of musicology was remarkable, eventually impelling her to compose her own chants, unusual in sound and singular in subject matter. Beyond the Book of Psalms, Hildegard’s adult writings—a substantial survival—show evidence of reading so wide as to rival and even surpass that of the most accomplished scholars of her time. She makes reference to the other books of the Bible, especially the Prophets,to the usual biblical commentaries, to liturgical texts, to the Benedictine Rule, and to the Western fathers—Jerome, Augustine, Gregory, and Bede. Her Plotinian Platonism probably came to her by way of the ninth-century Irish philosopher John Scotus Eriugena, whose sermons and ruminations were standard texts, and she seems to have read reforming contemporaries, such as Hugh of Saint Victor and Bernard of Clairvaux, as well as earlier Christian classics, such as the Shepherd of Hermas and Adso’s On the Antichrist. Some have speculated that there are hints in her writings of such Carolingianb authors as Isidore of Seville, Rabanus Maurus, Paschasius Radbertus, and Notker of Saint Gall; and there are strong suggestions that she had access to Greek (and perhaps to Arabic) medical works and even to arcane rabbinical treatises. This, for an age in which books were scarce and precious, is an astounding catalogue, a library available to few men and to (so far as we can tell) no other woman. The library must have belonged not to Jutta, who could hardly have accommodated it in her hut, but to the liberally lending monks of Disibodenberg. What went on in Jutta’s cell was a lifetime reading program. But what of the eight-year-old who was made to live in such unnatural confinement and who survived the rigorous reading program—and even flourished because of it? Does anything of her—anything personal, peculiar, intimate—remain in the historical record? To answer these questions we must step back a bit and consider more widely the currents of twelfth-century life, not nearly as open as ours to personal preference and psychological insight. Life spans had not increased since the classical centuries; indeed, they had dipped dramatically during the terrifying uncertainties of the barbarian influx and were only now—in the new economic and cultural stability of twelfth-century Europe—beginning to approach the best Greco-Roman levels. An eight-year-old, even a child of privilege such as Hildegard, was not as young in the eyes of her parents as she would be in ours. At the same age, her lesser-born male contemporaries were preparing for apprenticeships in the homes of strangers—millers, bakers, chandlers, glaziers, fullers, coopers, wainwrights, and such—and many of her female contemporaries, already betrothed, were beginning to contemplate their coming roles as matrons of households. Hildegard was thought quite old enough to make a lifetime commitment. But should we assume that Hildebert and Mechthild forced their daughter into an anchorite’s life? In Scivias, the book by which she is best known, Hildegard would counsel parents on the utter necessity of obtaining their child’s consent before offering him as an oblation. “If you offer a child to Me,” says the voice of Jesus, and that offering is against his will because you have not sought his consent to it, you have not acted rightly; you have offered a ram. How? If someone offers a ram at My altar without binding its horns strongly with ropes, the ram will certainly run away. So also if a father or mother offer their child, who is the ram, to My service, but do not honor his will, which is his horns, by assiduous care or supplication or entreaty or diligent exhortation, which are the ropes that bind him, since by all these the child should be brought to consent in good will; not having been proved by these tests, he will certainly run away, physically or mentally, unless God guards him by miracle. I had a green field in My power. Did I give it to you, O human, that you might make it put forth whatever fruit you wished? And if you sow sand in it, can you make it grow into fruit? No. For you do not give the dew, or send forth the rain, or confer fresh moisture, or draw warmth out of the burning sun, all of which are necessary to produce good fruit. So too, you can sow a word in human ears, but into his heart, which is My field, you cannot pour the dew of compunction, or the rain of tears, or the moisture of devotion, or the warmth of the Holy Spirit, through all of which the fruit of holiness must grow. And how did you dare so rashly to touch one dedicated and sanctified to Me in baptism, that without his will you handed him over to bear My yoke in strict captivity; so that he became neither dry nor green, not dying to the world or living in the world? Why have you so oppressed him that he can do neither? If I comfort him by miracle so that he may remain in the spiritual life, that is not for humans to look into; for I want his parents not to sin in his oblation, offering him to Me without his will. 1. Why did future generations characterize the Middle Ages as a time of destruction and ignorance? Who was served by that depiction? Which progressive aspects of this period were the most surprising to you? 2. The author attributes the rise of powerful women during the Middle Ages to the Madonna's central place in religious culture. How did perceptions of the Madonna shape the notion of the ideal woman during this era? 3. What similarities exist between the ways Hildegard of Bingen and Eleanor of Aquitaine used their power? How did the politics of church and state mirror one another during the Middle Ages? 4. What was Hildegard's guiding premise in her written exchanges with authority figures in the Church? How did her mystical visions seem to affect her tenacity? How would modern-day Roman Catholicism respond to a nun like her, or to an unconventional believer like Francis of Assisi? 5. How might European history have unfolded if Eleanor had ruled, rather than Henry (and later, Richard)? Would she have created an atmosphere of greater or less political stability? 6. What does the story of Abelard and Héloïse indicate about the changing concept of love during the Middle Ages? How does this couple compare to the ideals of courtly love also flourishing at the time? Were Héloïse's views on marriage realistic or idealistic? 7. What contemporary fallout does the West experience today as a result of the Crusades? Why was Francis of Assisi's approach to diplomacy-to sail to Egypt and meet with the Sultan al-Kamil in person-both rare and futile during the Middle Ages? 8. How was Francis able to find so much universal beauty in the world, as evidenced in “The Canticle of the Creatures,” while nature was dealing his health such horrific blows? How did humanity's understanding of the natural world change during his lifetime? 9. How would you characterize the scientific inquiries spurred by figures such as Roger Bacon? What can be learned from Thomas Aquinas's attempts to reconcile mystery and reason, or faith and facts? In what way do the intellectual pursuits of the Middle Ages speak to twenty-first-century quests for knowledge? 10. Do the chapters on medieval art indicate that art captures and preserves the way a community perceives the world, or does art change (even control) the way a community perceives the world? What is the significance of the fact that art turned realistic, particularly through the vision of the Florentine painter Giotto? 11. What were your reactions to the book's numerous photographs of medieval art and architecture? Do the artists and artisans seem to share a common definition of beauty? 12. What do Dante's poetry and life story tell us about the medieval understanding of God? What did Dante himself try to tell us about earthly concerns versus eternal ones, and the quest for peace? 13. What do the book's maps demonstrate about the role of land in the power struggles of the Middle Ages? On a smaller scale, which regions were more culturally permissive (did communities flourishing along the Rhine differ from those along the Seine)? What are the contemporary effects of these geographic shifts occurring centuries before? 14. The intermezzo, “Entrances to Other Worlds,” provides a portrait of an early form of globalization. In what ways did religion and commerce intersect at that time? Were there any secular realms in business then? 15. Mysteries of the Middle Ages begins and ends with reflections on classical civilization. How did medieval societies respond to these legacies? From the death penalty (see the author's note regarding Dominique Jerome Green in the book's introduction) to the church scandals described in the postlude, how does the twenty-first-century world respond to the legacies of the Middle Ages? 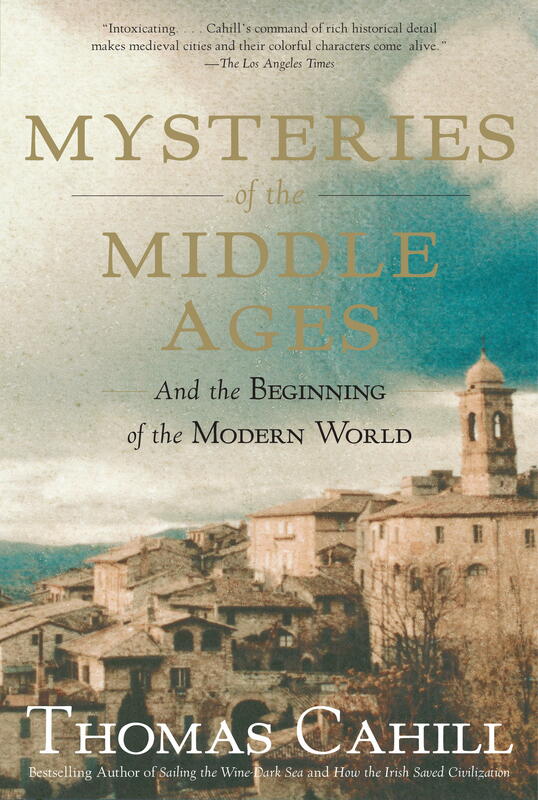 Mysteries of the Middle Ages: And the Beginning of the Modern World is the fifth book in your Hinges of History series and this volume begins the series’ exploration of the modern Western world. Why does the modern world begin with the Middle Ages? What time period, exactly, are we talking about? “The Middle Ages” is a wishy-washy term, first established by Renaissance humanists of the sixteenth century, who thought highly of the classical (or Greco-Roman) age and very highly of themselves in what they called the modern age. These humanists looked down their noses at everything that had gone on in the middle period between the classical age and themselves. Till fairly recently their prejudice was accepted by most scholars. But now, we are coming to realize that many of the things we consider characteristically modern – the gradual emancipation of women, university life, modern philosophy and science, realistic art, and even something as seemingly unmedieval as the separation of church and state – got their start in these so-called Middle Ages. The Middle Ages are generally thought to run from the Christianization of the Roman Empire under Constantine in the early fourth century to Columbus’s first voyage of discovery in 1492. The first part of the Middle Ages, often called the Dark Ages and running into the eleventh century, was dealt with in How the Irish Saved Civilization, the Introductory Volume to The Hinges of History. By the end of the eleventh century, however, an increase in scholarship, commerce, and the size of cities set the stage for a flowering of culture in the twelfth, thirteenth, and fourteenth centuries. This flowering, a true renaissance that is now referred to as the high Middle Ages, is the subject of Mysteries of the Middle Ages. By the mid-fourteenth century, however, the Black Death cut short this flowering and gave us the century and a half known as the late Middle Ages. Some readers might assume they already know about the Middle Ages – that it was one big muddle of knights, lords, castles, and ladies with a few poor peasants toiling endlessly in homespun robes. In other words, not much important going on until the Renaissance. But your new book is full of surprises about the Middle Ages. Can you tell us about some of them? I want to make sure there are still some surprises left for my readers to contemplate when they get to reading the book itself. One surprise I might mention here is the rise of realistic art. Classical art was realistic in the sense that human anatomy was well understood. But only in the Middle Ages are the questions asked: What would it have felt like to be this or that person, to have such-and-such an experience? What would it have looked like? Here the physical and anatomical are combined with the psychological and the subjective to give us for the first time realism – in the modern sense – in both the plastic and the dramatic arts. The first great exponent of this new realism is the painter Giotto, whose pictures were so realistic that people of his own day often mistook the painting for reality, for “the very thing itself,” as Boccaccio tells us. One of the central ideas of Mysteries of the Middle Ages is that the modern feminist movement has its roots in early Catholicism. Most people would be surprised by that idea. In fact, they might even go so far as to posit exactly the opposite given some of the current teachings of the Catholic Church. What are they missing? And can you talk a bit about the discrepancy between what medieval church leaders may have intended vs. what their followers did? Religious practices often grow beyond the limits that their originators set for them. The cult of the Virgin Mary is a good instance of this. The desire to worship Mary in popular devotion came not from priests but from ordinary people, mostly women, and was at first only reluctantly allowed by the clergy. But as the cult grew in scope, many priests began to endorse it enthusiastically. Still, they could hardly have intended that the central placement in the church of an image of the Virgin – an ordinary woman with a child – would encourage a gradual rise in the status of women, a rise exalted enough for us to find in it the beginnings of modern feminism. This woman in the center of the church helped bring about an age of powerful abbesses, like Hildegard of Bingen, and powerful queens, like Eleanor of Aquitaine. It may even have triggered the beginnings of the romantic (and adulterous) poetry of the Courtly Love tradition – certainly not a development favored by medieval bishops! You also credit early Catholic Europe with advancing art and science. But didn’t art and science really begin with the Greeks? Aren’t you giving Catholics too much credit? To call the people of the Middle Ages Catholics is a bit of a misnomer. They were Western Christians. Only after the Reformation can we speak properly of Catholics (and Protestants) in our contemporary sense. But in the popular mind the medievals will always be Catholics. The Greeks certainly gave us our respect for – and even obsession with – measurement and accuracy. And this obsession drives both our science and realistic art. But Christianity added something new, something the airy ancient Greeks could never have dreamed of: the orientation toward finding truth in flesh, because “the Word was made flesh” – that is, God became human in the person of Jesus Christ. This central truth of Christianity is the driving force that makes sense of all the best things in the medieval world, because it gave the medieval world a passion for human experience, a passion to look for ultimate truth even in the material world, a world the Greeks looked down on. What exactly do you mean when you describe early Catholicism as a cult? That’s a pretty loaded word in modern times, bringing to mind dangerous extremist figures like Charles Manson and David Koresh. I don’t believe I do. Rather, I describe first-century Christianity as a sect, “a hunted, marginal sect” of Judaism, which is what it was to begin with. The great question, which I deal with in the Introduction, is how this insignificant sect of a decidedly minor religion came to establish itself as the dominant faith of the late Roman Empire. It is a fascinating story, fraught with mystery. It is really the story of how the ancient Romans – those cruel, crucifying, blood-thirsty chaps – turned into the Italians, people who love to sing, eat, and make love. I use the word “cult,” not in the contemporary meaning of a secretive, unhealthy sect, but in the ancient meaning of a form of worship. Both the cult of the Virgin and the cult of the Eucharist served as catalysts for many of the most important innovations of the Middle Ages. We meet many fascinating historical figures in Mysteries of the Middle Ages, from Hildegard of Bingen to Dante Alighieri. Is there any single person in your book that you feel exemplifies the idea of “the great gift-givers” of the Middle Ages? Though I would say that Giotto and Dante are my personal favorites, each of them a great storyteller in his respective medium, I would also admit that Francis of Assisi is almost certainly the greatest of all medieval figures. In some ways a difficult, maybe even a pathological, man, Francis nonetheless had the most lasting impact not only on his own time but on ours. His invention of the Franciscans and of the gentle, humble, life-loving, world-restoring, always-blessing Franciscan way of life is almost certainly the most important innovation in the history of Christianity after the life of Jesus himself. Not only this, but Francis was, as his biographer Donald Spoto calls him, “the first person from the West to travel to another continent with the revolutionary idea of peacemaking.” He sailed from Italy to North Africa to meet with the sultan and bring the age of the Crusades to an end. He almost succeeded – and would have, had it not been for a curial cardinal who was certain of victory against the Muslims. Of course, he went down to defeat amid terrible loss of life. The lessons in this tragic story are almost unbearably contemporary. You promised readers that in this book you would touch upon the question of Islam. How does Islam figure in the Western world in the Middle Ages and how does that history bear upon current events? You’ve said in the past that Islam was not a major source of western sensibility. Is this still true today? Though Islam is on everybody’s mind these days, it has never exerted extensive influence over Western sensibility. The shared history of Christianity and Islam is almost entirely a history of people speaking and understanding at cross-purposes to one another. Could we ever get beyond this unfortunate state of affairs? We could, and Francis of Assisi shows us how. Mysteries of the Middle Ages looks different from your other books. It’s heavily illustrated throughout with color photographs. Why? The Middle Ages were visual, perhaps the most visual age in all of world history. They demand a highly visual book if the reader is to come to a true appreciation of their deeper meaning. Your last chapter takes on the modern Catholic Church. What are your criticisms and what would you like to see changed? Why did you include this chapter? I have no quarrel with the Catholic Church, if one takes the church to mean its people. My quarrel is with the higher clergy – the bishops, archbishops, cardinals, and popes – who have hijacked the church for their own purposes and deformed it to such an extent that if Saint Peter, the humble fisherman and friend of the outcast Jesus, were to rise from his tomb beneath the papal altar in the Vatican basilica and come upstairs to look around and listen in, he would have no idea that any of this was in any way connected to him – and even less so to Jesus! The people must take back their church from these imposters. Since Mysteries of the Middle Ages concerns the magnificent Catholic contribution to Western sensibility, it seemed to me essential that I also acknowledge the contemporary failure especially of American Catholicism in the face of the priestly pedophilia plague and its episcopal cover-up. Can you tell us what the next volume in the Hinges of History series will be about? Each volume of the Hinges of History is intended to be read with pleasure and even surprise; it is not a series of academic obligations. Thus, in the past I have refrained from talking about the books to come, as if I was creating a syllabus. But now that there are just two volumes left to write, I imagine many readers can see where I am headed. So I will come clean: Volume VI will treat the Renaissance and, especially, the Reformation, thus tracing the Protestant contribution; Volume VII, tracing the secular-revolutionary-democratic contribution, will begin with the Enlightenment and go to . . . Well, I think that’s enough to say, for now.